Our Christmas Fair is held annually. This year's date is TBD. It is known as one of the largest and most successful church fairs on the South Shore. 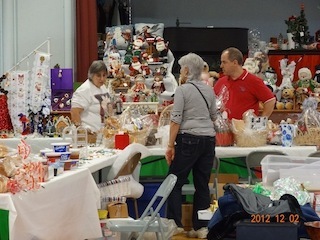 A tremendous variety of homemade gifts, handcrafted items, baked goods, artisan’s works, discounted gift certificates, jewelry, raffles, and more are available at attractive prices in a festive environment. The Fair proceeds benefit Christ Church Quincy Outreach programs. Programs we have supported in the past include South Shore Elder Services, Interfaith Social Services, Literacy Volunteers of America, Maria Droste Counselling Center, Horizons for Homeless Children, Habitat for Humanity, and Home for our Troops.